Used M&W Bb/F/D Dependent Bass Trombone. This instrument has been lightly used and only has a few surface scratches. 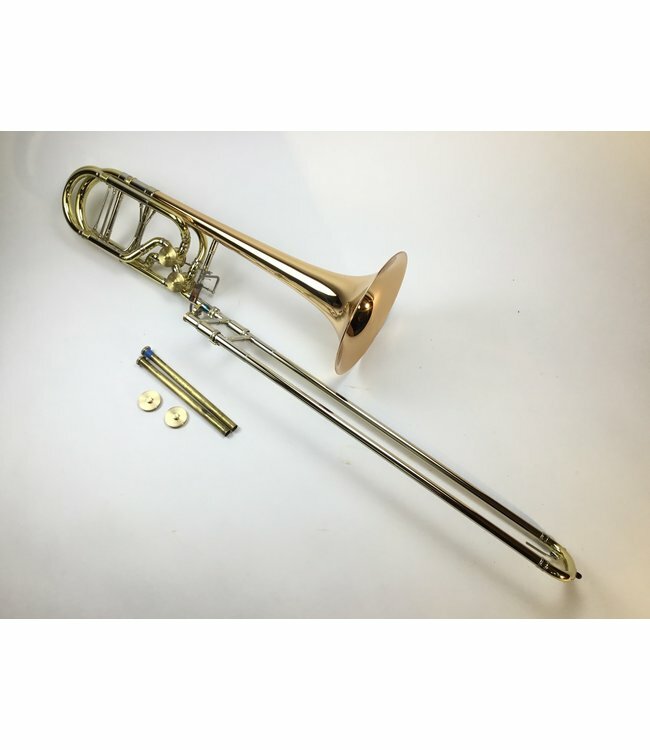 The bass trombone is reminiscent of a Holton bass trombone with a single bore .562 nickel silver slide with a yellow brass crook on the hand slide. The hand slide is set up to use press fit leadpipes and come with 3 press fit leadpipes from M&W. The valve section is dependent and set up in the standard Bb/F/D tuning. The valves also come with a regular weight and light weight caps. The instrument has a yellow tuning slide and a 2 piece 9.5 inch red brass bell with an unsoldered bell rim. Does not have case.